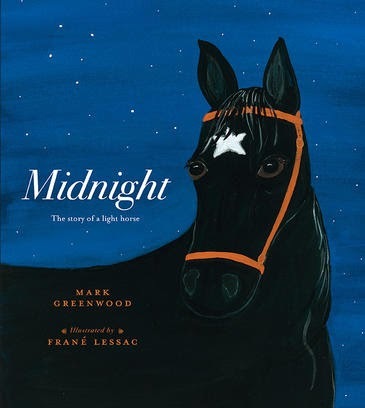 The poignancy of historical picture books is a joy to immerse oneself in, but most particularly when it's work done by this formidable creative duo - husband and wife team, Frané Lessac and Mark Greenwood. In their latest book, Midnight: The Story of a Light Horse, we're taken on a journey back to 1917 and the battle of Beersheba in the Middle East, close to the Turkish bastion of Gaza. It follows the true story of a man from the Hunter Valley of New South Wales--Guy Haydon--and his beautiful black mare, Midnight. The duo served in the Australian Light Horse Brigade--and were amongst the first to cross those terrifying trenches, and charge their way into enemy lines--and into history. Chilling, moving, this narrative non-fiction picture book will enchant readers of all ages--for its simple yet beautifully-written content, and for the vibrant, child-friendly imagery Lessac does so well. Like the dance of the men of the 4th and 12th Regiments on 31 October, 1917, Midnight is a dance between author and illustrator that touches the heart. Horse lovers take note. My daughter has already snaffled this book for her room.